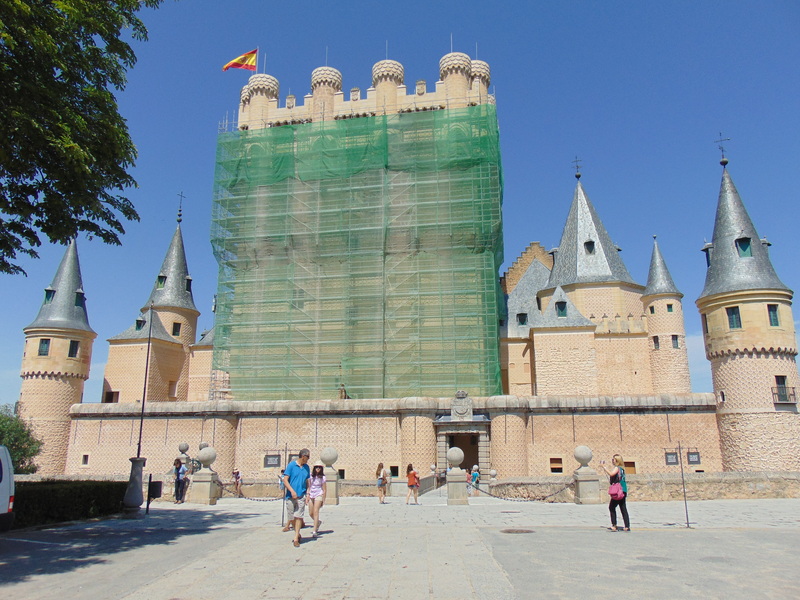 While we were in Madrid in July, we were faced with a choice between two day trips: to Toledo or to Segovia? 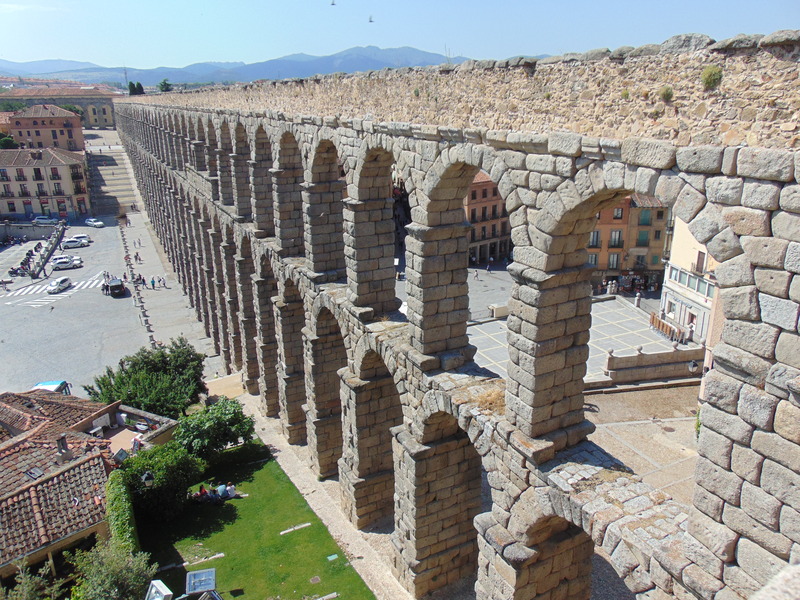 After a little research (comparisons on Google Images), we both felt Segovia looked the more attractive, with its famous aqueduct and fairytale castle. The aqueduct was as spectacular as expected. We hadn’t planned on paying to go in, but we’d thought we would at least get to admire it from right outside. Alas, no. 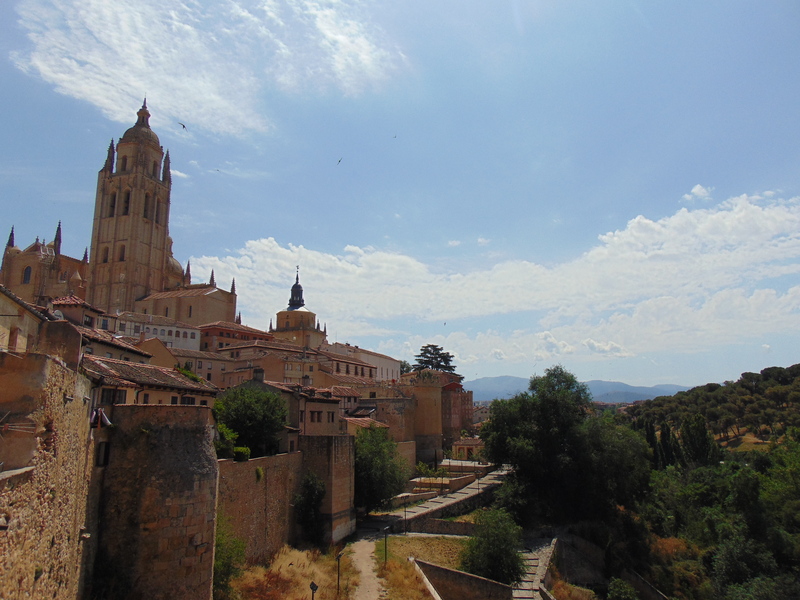 Still, we enjoyed Segovia and found it was a pretty enough little medieval town to be worth a visit even without a spectacular castle. 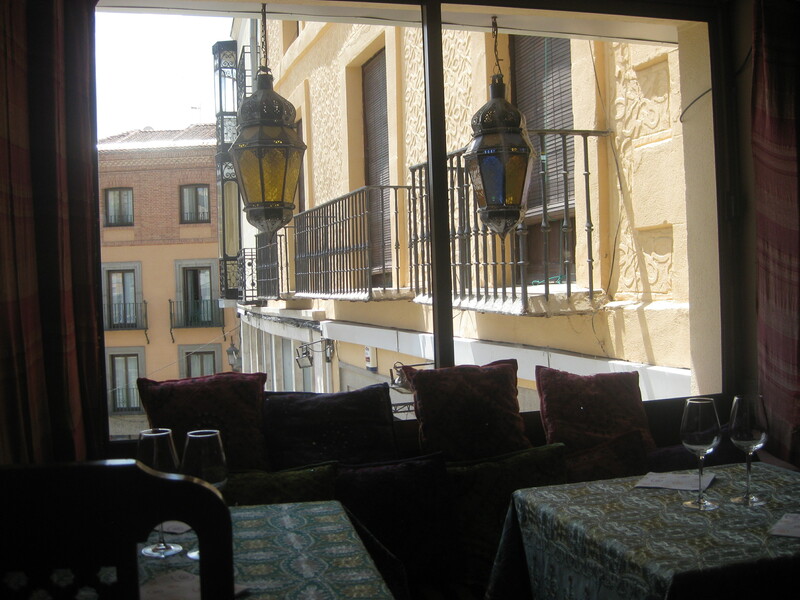 For lunch, we popped into Restaurante Tuma. There were three veg-friendly listings on Happy Cow, and this one seemed like a safe bet and was also ideally located. 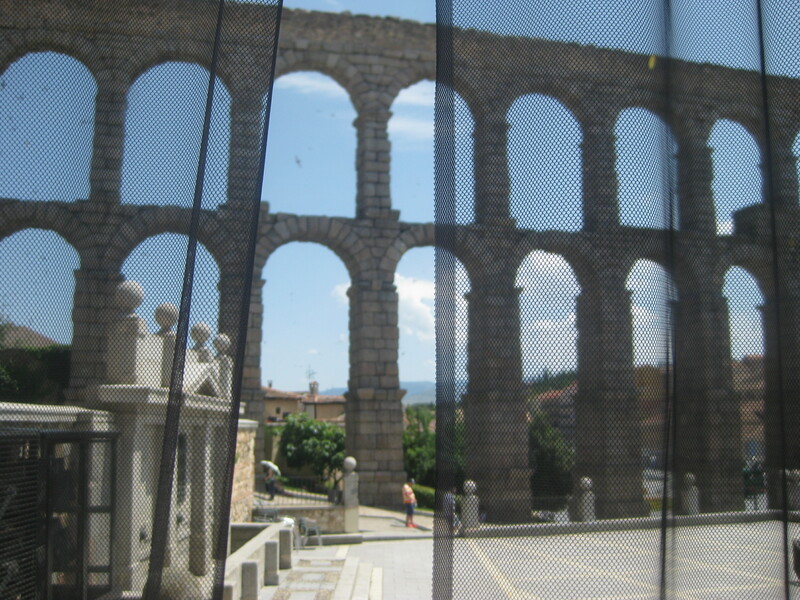 It’s right on the steps of the aqueduct: above is the view from the window. The decor has a Middle Eastern theme, as does the menu (though rather disgustingly, that includes the Segovia speciality, suckling pig, in schwarma form). The kitchen was just opening when we arrived at 1pm, and we were the only customers for most of the time, so we didn’t encounter any meaty dishes. 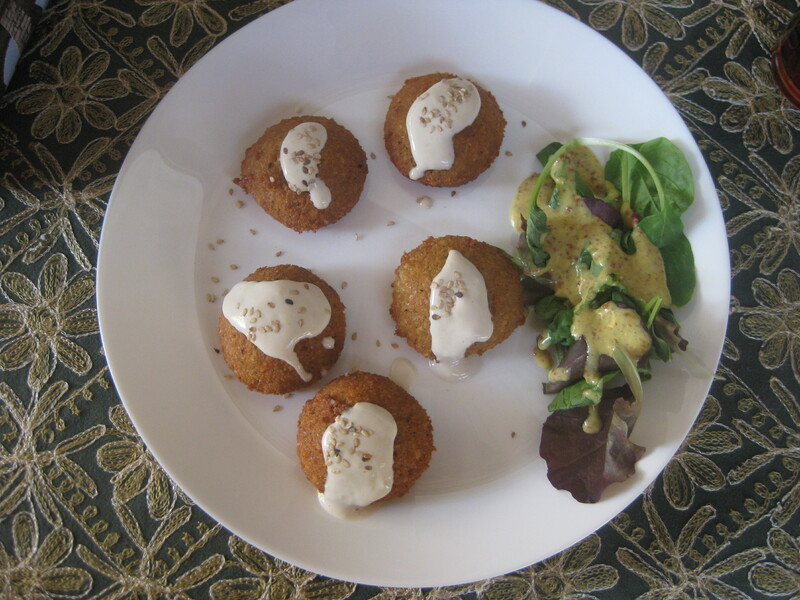 There’s a vegetable couscous dish on the menu, but we decided to play it safe and get some hummus and falafel. 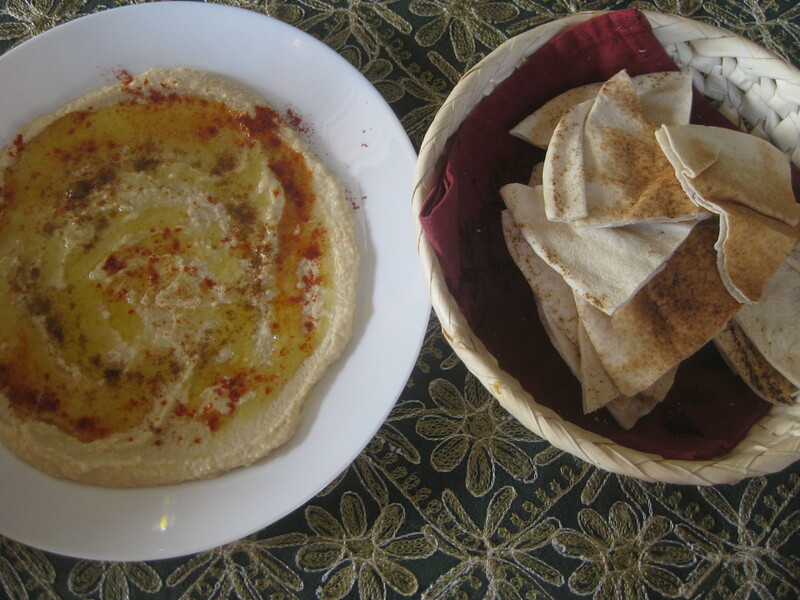 We’d expected the two to arrive together, but instead were given the hummus as a starter. It was tasty hummus, with plenty of paprika and oil. It was also €7. It might look like a nice bowl of hummus, but that’s actually a plate with a very thin layer. The bread was nice, but it’s very much overpriced. So we were a bit worried about the falafel. We’d ordered two plates (5 pieces each), also for €7 a pop. I enjoyed the flying saucer shape, and they were really crispy outside. The tahini topping was nice (the server assured me that it was vegan when she presented the dish), but it’s a shame there were no nice green herby leaves in the falafel. All in all, it was filling and we were in a lovely air-conditioned restaurant with good service. But it was €21 for not a lot of food. Unless you have your heart set on an indoor dining experience, I would recommend taking your own falafel and hummus picnic at a much lower cost. 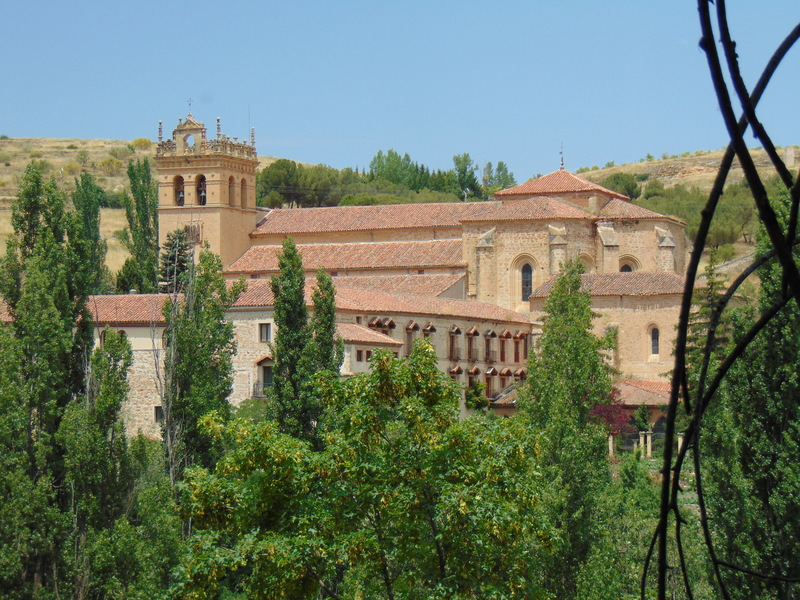 Still, our meal fuelled us up for a walk out to one of the nearby monasteries, the Monsastery of Santa Maria del Parral. This is my top tip for Segovia. 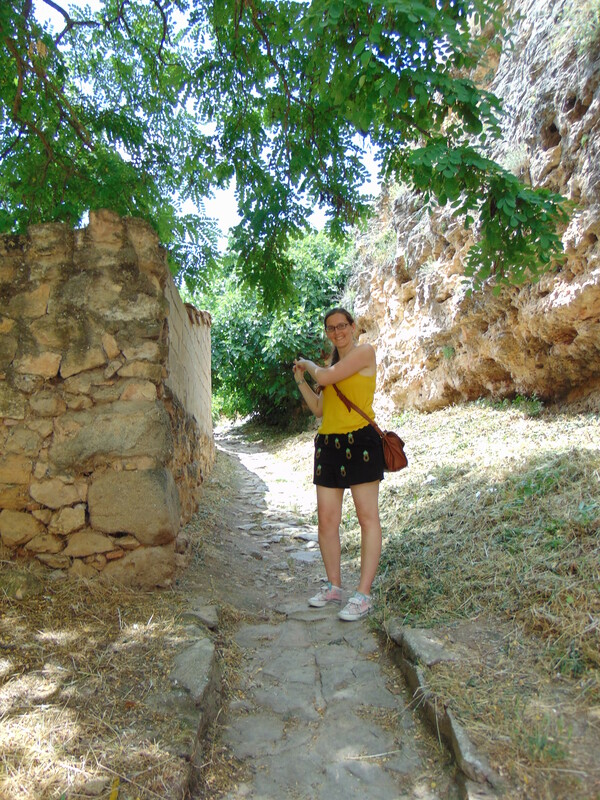 It was about a 30-40 minute walk outside the city walls, and we only encountered a couple of other tourists on the way, which was a pleasant contrast from the aqueduct, where Dr HH was berated for having the cheek to get in the way of a woman taking a squillion selfies in the same spot. Newsflash: getting a selfie with no people in the background is not a human right! 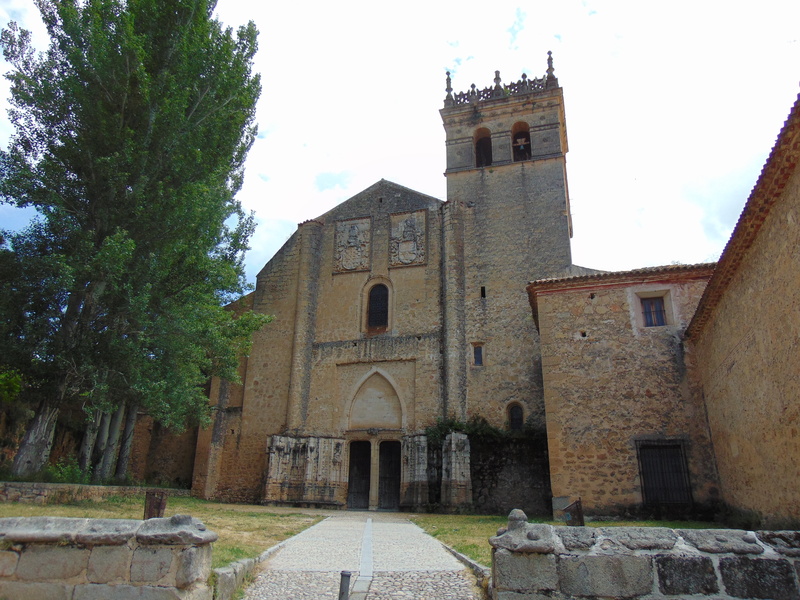 We had a little look at the peaceful old monastery, and then turned away to walk back. That’s when we saw this little track! A brief scramble up this path (you can’t miss it when you turn away from the monastery) brought some spectacular views of the medieval town. Finally! An attractive view of the castle. And the rest of the town isn’t so shabby, either. 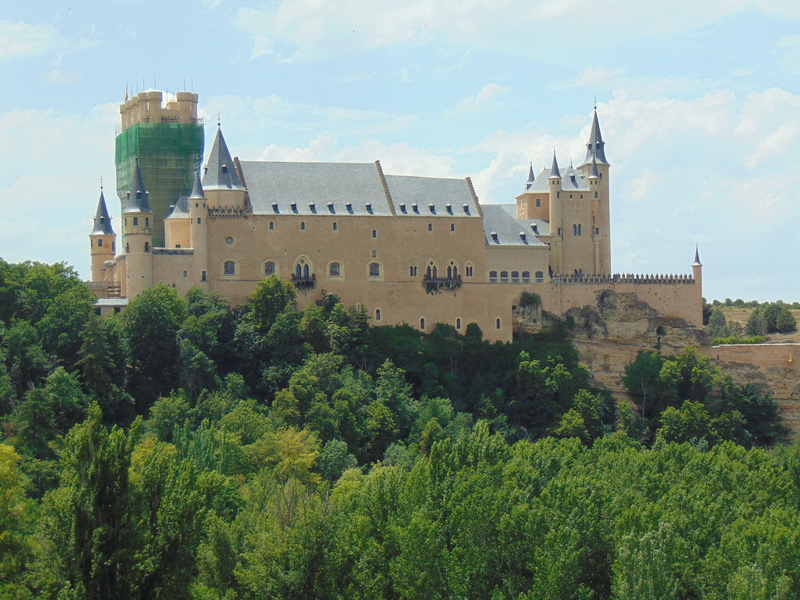 So if you ever take a day trip from Madrid to Segovia, make sure you take a packed lunch and venture out to the monastery – it’s marked on the maps from tourist information and the seclusion and viewpoints make it well worth the wander. 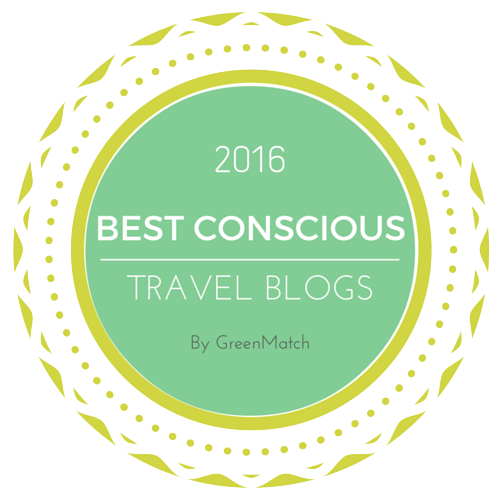 This entry was posted in Travel, Vegan Mofo and tagged Restaurante Tuma Segovia, vegan mofo, vegan Segovia, vegan travel, vgnmf16. Bookmark the permalink. What a beautiful looking town! I had to laugh at the building works on the castle. That happens to me pretty much every time I go to any houses or castles that are meant to be pretty. Scaffolding everywhere, and never the unobtrusive sort! That falafel looks measly. My husband would have eaten three plates of that and still been hungry! I think I’m cursed too, every time we go to see a cathedral it’s covered in scaffolding! At least we finally got the nice view. And we definitely went for snacks as soon as we got back to Madrid! Strangely enough I ended up visiting segovia in an attempt to avoid madrid when I had to fly out of but which I took a dislike to. 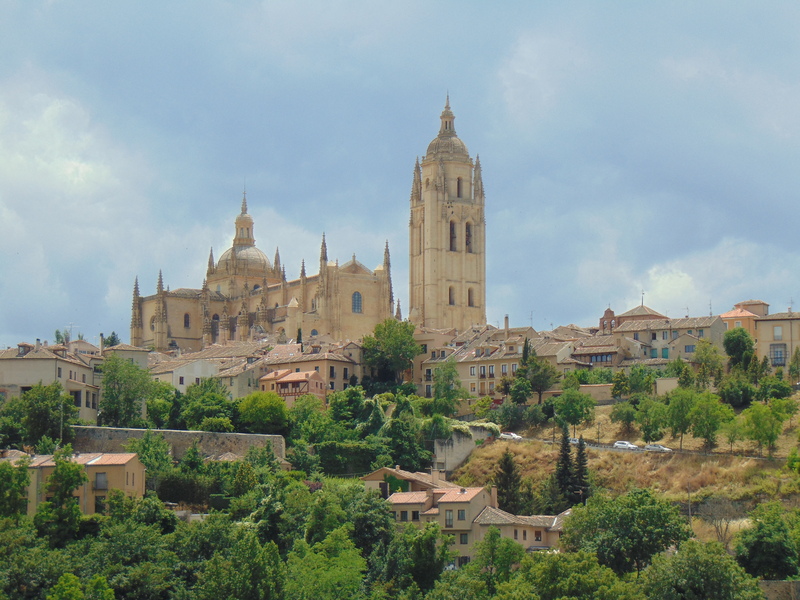 I really loved segovia though it is many years ago that I went there and can’t remember it well – I have a feeling I went to a paella place but can’t remember if I even had paella. It just seemed a nice town to sit and enjoy life. And I was told that the castle was inspiration for Walt Disney’s castle but apparently they say that about a lot of castles. Yes, I heard the thing about Walt Disney (but I’m sure I’ve heard that before too! ).